A traditional lion dance welcome for the mainland and overseas guests and participants. The Standing Conference of Presidents of Open and Distance Learning Institutions (SCOP) for the International Council for Open and Distance Education (ICDE) was held on 11-12 October 1999. Hosted by the OUHK, the Conference was officiated by Secretary for Education and Manpower Mr Joseph Wong, OUHK Council Chairman the Hon. Charles Lee, OUHK President Prof. Tam Sheung-wai and ICDE Secretary-General and Chief Executive Officer. More than 50 CEOs and senior academic leaders representing 45 institutions from 20 countries attended the Conference and discussed three major themes focusing on education via the Internet, global institutional collaboration, and research for improving quality in distance education. The conference aimed to strengthen the participating institutions' competitive advantages for the new global environment and marketplace in open learning and distance education. Speaking at the Opening Ceremony of the Conference, Mr Wong reiterated the Government's continuing support for lifelong learning and the further development of the OUHK. He said education service was an emerging area of E-commerce. In the visible future, lifelong learners could find more choices and better programmes in the Internet, as if they were shopping in a supermarket. ICDE Secretary-General and Chief Executive Officer Dr Reidar Roll (left) receiving a souvenir plaque from OUHK Council Chairman the Hon. Charles Lee. Also at the ceremony, Mr Lee said that the rapid advances in information and communications technology today had opened up a vast realm of new opportunities, and revealed unforeseen fields for exploration in both theories and practices. Prof. Tam said government support was crucial for the development of open education. In recent years, the governments of more and more countries have come to recognize the significant role played by open learning systems in raising the education standards of their people. Among them, the Hong Kong SAR Government was quick to realize the importance of lifelong learning and continuing education in its desire to develop Hong Kong into a knowledge-based community. Plenary session speakers included Prof. Dominique Abrioux, President of Athabasca University in Canada, Prof. Geoff Peters, Pro-Vice-Chancellor of the Open University in the UK, and Prof. Olugbemiro Jegede, Director of the OUHK's Centre for Research in Distance and Adult Learning. 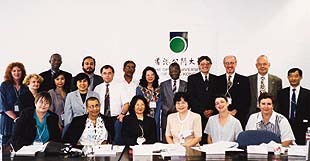 Twenty-one librarians and university administrators of institutions around the world gathered at the OUHK on 11 and 12 October 1999 for a Roundtable Conference. The Roundtable allowed participants to exchange views on how to cope with the development of their institutions in the use of new technology, and in the provision of library services to distance learners. hMr Lam Kin-chung (middle), sponsor of the Librarians' Roundtable and Specialized Workshop on Institutional Research in Open and Distance Learning, with OUHK Librarian Mrs Mok Wong Wai-man (right) and Mr Alex Wong, Head of Public Affairs.